One day I was standing at the bus stop, waiting for one of my children to return home from school. I was thinking about concerns I had over the different ways I saw competition being a part of my life. 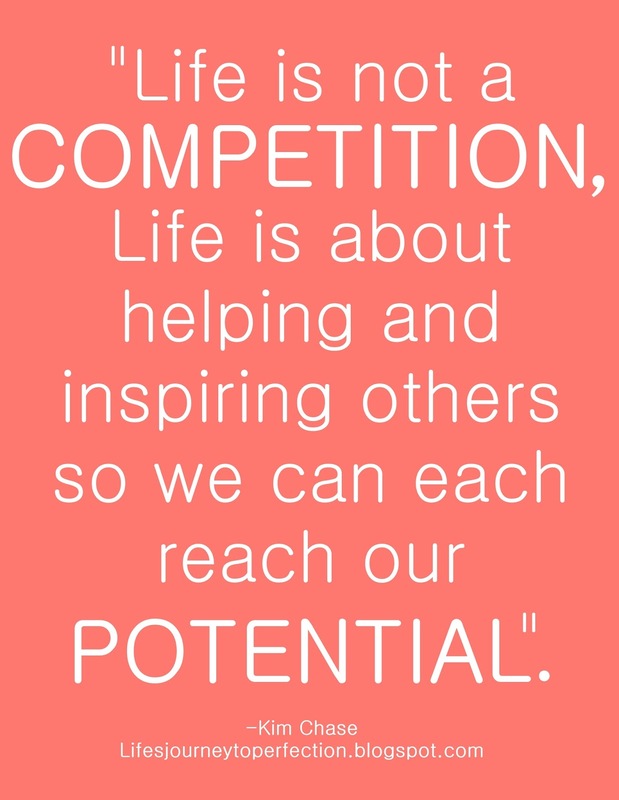 The thought came to me, "Life is not a COMPETITION, Life is about helping and inspiring others so we can each reach our POTENTIAL." I thought it was such an important thought that I immediately typed it into my note app on my phone. Thank goodness for technology, right? That little thought has been on my mind a lot, I have pondered over those words and have come to some conclusions. "the act of competing; rivalry for supremacy, a prize, etc." I have seen competition everywhere, I have seen it in our schools, children compete for friends, they compete to be the smartest in the class, or the most liked. As they get older they compete with each other to be the top of their class to receive "a prize", a scholarship and a spot in a leading university. Of course competition is huge in sports. I have seen parents spend enormous amounts of time and money for their child to be on a certain team. We see athletes compete with each other to be the best player on the team, and to be the best team on the field/court. We see it in our careers competing to receive the higher pay or the more prestigious job. Competition seems to even creep its way into families and friendships, I have seen my children compete with each other, even things as simple as who is the first one ready in the morning. We see it as we look at a friend or neighbor compare ourselves with them, and desire to have more or be better than they are. We see competition, it seems in many aspects of our lives. The place we do not see competition is in the eternal plan of our Heavenly Father. Actually, it is the complete opposite. Instead of competing with each other we are asked to lift, strengthen and support each other. We are to serve one another. We are to seek to be a peacemaker, to help each other along the path that leads to eternal life. Why does competition seem to encroach upon our lives. Maybe it is because we desire to be successful, in the eyes of the world. Maybe it is because we seek to be admired or loved. Maybe it is because we think that if we or our children are the best it will bring us happiness. Or maybe it is as simple as we are just afraid of failing. There seems to be many reasons and ultimately it all boils do to PRIDE, which is a tool Satan uses to ensnare us. One thing I have pondered is, do the results of competition bring us happiness? To be on top, the best, the highest paid or the most prestigious might bring with it some benefits that resemble happiness. But, we also see some of the highest paid, "BEST" in their field people, who are so unhappy it is just sad. On the other hand I guarantee if you ask anyone who has helped to lift another, who has served another, who has celebrated another's success, they will tell you that, that is true happiness, the kind that lasts. I am not saying we don't try to be successful, I am just saying that we will be more successful and happier if our main focus is not to be better than another, but instead to be the best we can be and lift others along the way. You might even be thinking to yourself, here we go another person who thinks everyone should receive a trophy. Nope, I am not that person and that is not the purpose of this post. I do think that people should be recognized for their achievements. The problem is PRIDE and MOTIVES. I recently, had two drastically different experiences with two of my children playing on two sport's teams. One was on a team where the coach, I believe had the desire to instruct the children, help them learn the sport and give each child the opportunity to participate and work together as a team to succeed. This team was fun to watch. The coach had prepared the team during practices, they knew what was expected of them individually as members of the team, they were continually instructed as they played their games, and when mistakes were made they were instructed on how they could improve. This team was successful, not because the teammates were competing against each other, or even the fact they were trying to be the best team, but rather they were working together, playing their individual position and playing the best they could, with continued instruction on how they could improve. This team got it, the focus was on elevating and encouraging each member of the team to reach their potential. In contrast, my other son was on a team that I am sorry to say, but was frustrating for me to watch. The focus was more about winning or being better than their opponents, than it was on instructing and elevating each member of the team. There were a few players given attention at practices and games and they were the ones who ran the plays. The other players seemed to be dispensable. They had the potential to be great, but fell short because the focus was on winning, not on strengthening each player, and working together as a team. The importance of each team member was not emphasized. This team was not as successful, I do not think they looked like they were having as much fun, and for me they were not as enjoyable to watch. This team didn't get what the focus should be, they were too blinded by competition. Why do I share this? For me it is an analogy of the difference between competition being the driving force, contrasted to elevating others to be the best they can be, armed with instruction and the knowledge they need. Do you see where I am going? If we live our lives looking for how we can get ahead of another, we are not going to be as successful or as happy as if we look for ways to lift others up with us as we try to reach our potential. We are all on the same team, we are not opponents. I love this quote! What amazing counsel to follow, "It is the comparison that makes you proud: the pleasure of being above the rest. Once the element of competition has gone, pride has gone" (-C.S. Lewis) The key is to recognize our motives. Are our motives to be better than another, are we comparing ourselves with another? Or are our motives to help each other achieve our potential? Very well said and thought out. Thank you for sharing your inspiration with the rest of us. Kim .... FANTASTIC words. I agree with you fully. Thank you.